Greetings from a peripatetic photographer and writer! I’ve just returned from a voyage to Paris, then leading a group in Malta, followed by a week exploring Sicily. Prior to this, in October I was on a road trip up the California and Oregon coast. In September, I was photographing in the rugged land east of the Sierra Nevada Mountains. Over the summer I was in Maine, New York, and Germany. The spring found me first in the southwest of France, then hiking along the Camino de Santiago in Spain, and finally in the Balearic Islands. If you are interested in the images from these travels of mine, I urge you to take a look at my blog. Words do matter to me, and many times the words in my blog tell the stories behind the photo, or at least my thinking making the photo. For your reference, here’s the Paris category on my blog, the Malta category, the first story from the coastal Oregon trip, and the story that marks the start of my Camino. My Flickr stream and Instagram feed have more images than could possibly be on my blog, and these photos may help to fill in some of the backstory. For personal, familial, creative, and artistic reasons I am contemplating a future with less in the way of in-person workshops that I lead. On this good news and bad news paradigm, I still will be teaching via my books, video courses such as my Photoshop Backgrounds and Textures, and on this website. I have book revisions scheduled for the coming year, along with new books, and a new video course planned for early in the year. It’s not easy to change course on a dime, and this will be a busy workshop year for me as well. For a long time, folks have been asking me to lead a workshop in Florida. I am finally doing so in February, at the Palm Beach Photographic Centre, with the topic being Garden and Flower Photography. In April, I am looking forward very much to once again to leading a destination travel workshop to Paris and Monet’s gardens at Giverny. If this intrigues you, this small group of photographers is edging towards completeness, so it might be a good time to sign up, particularly if you are interested in gifting yourself and/or a loved one with a lavish photographic Christmas present. 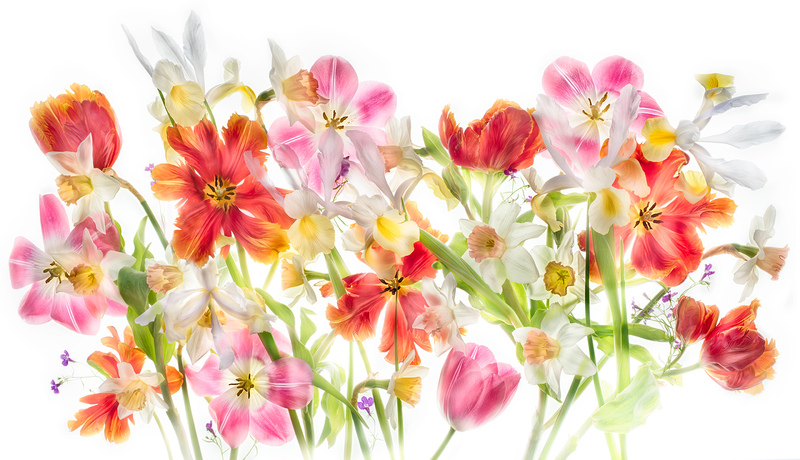 June brings once again our annual Photographing Flowers for Transparency master workshop, held here in Berkeley, California (a few spaces are still open). In October 2019, I am planning to be the photographic “Golf Pro” on a destination photo workshop to one of my favorite parts of the world, Northern Morocco, with logistics spearheaded by a major travel organization. I like to quote Yogi Berra’s witticism that “It’s tough to make predictions, especially about the future.” But of course we all make these predictions (and plans) regardless. As I look ahead at the new year, and contemplate both the needs of my family and how best to nurture my own artistic creativity, I do feel that cutting back on in-person teaching is almost certainly a step I need to take, at least for a while. The implication of course is that if you’d like a hands-on workshop with me, or to travel with me, this would be the time. If not now, when? Click here for my Workshops & Events page with the 2019 listings. So which one is jewel-encrusted? I seriously want to know which statue is “the” Maltese Falcon, the stuff (as Bogart puts it in the movie) that dreams are made of. Could they all be The Maltese Falcon? The badlands in this image are along the middle fork of the Kings River, photographed from a higher elevation. The point of this fairly abstract monochromatic composition is the contrast between the jagged shadows on the right and the comparable ridges in the folds of the mountainous land on the left. I made my print of Badlands (sold thanks to Weston Gallery) on the wonderful, thick Moab Juniper Baryta Rag (it has the sensuous smell of a print from the chemical darkroom, and brings back those days in a Proustian sense when I give my print a sniff!). By popular request, I’ve posted the informational slides from my Getting Your Camera Off Auto presentation in a new slideshow FAQ, Understanding Exposure 101. I just made this large panoramic print of the High Sierra Crest on commission via Weston Gallery on Moab Paper Juniper Baryta Rag! The print is shown here curing, with our printer in the background. I’ve had many requests for a Florida-based workshop, and I’m happy to say that this indeed will be happening! Please note that the workshop size and places are limited. I’ll be leading a Garden and Flower Photography Workshop at the Palm Beach Photographic Centre in West Palm Beach, Florida. The dates of the workshop are February 8-10, 2019. Click here for more information and registration. Workshop description: This workshop combines field sessions to practice garden and flower photography with classroom and studio instruction in photographic and post-production techniques. Classroom and studio sessions will focus on specific areas of technique, including macro photography, focus stacking, and lightbox work.Field sessions will include a number of different kinds of gardens and a variety of flower photographic situations. Emphasis will be on supporting each participant in achieving an individual approach to floral, botanical, and landscape garden photography. Post-production will be shown in the context of utilizing an individual workflow customized to each participant, as well as best practices in Photoshop and color management. Along the way, we’ll examine the theory, philosophy, and practice of garden design in the context of photography, as well as working with individual participants to develop a cohesive and personal body of work. Harold Davis is a bestselling author of books including Photographing Flowers (Focal Press), the developer of a unique technique for photographing flowers for transparency, a Moab Master, and a Zeiss Ambassador. He is an internationally known photographer and a sought-after workshop leader. Harold is a popular workshop leader and has taught at institutions including the Center for Photographic Art, Maine Media Workshops and College and Point Reyes Field Seminars. On my way home from Palermo to San Francisco, I’ve had to change planes a couple of times, and am overnighting at Charles de Gaulle Airport (CDG) near Paris. Travel is nice, but coming home is even better! I am looking forward very much to seeing Phyllis and the kids. At CDG, I am staying at the Sheraton. This hotel is really a fun place to stay, and is an integral part of the airport, you walk here from the arrivals and to the departures area without going outdoors, and it is surrounded by runways and airport access roads. The sound proofing is perfect, and I can’t hear a whisper from all the activity out my windows. The design of the hotel is shaped like a ship with a prow, or (more aptly) an airplane. The internal atrium has a glass floor, and I was surprised to note that you could see down with a view through a transparent ceiling (the floor of part of the atrium) into the train platforms for the RER into Paris. The Sheraton at CDG is a fun place to stay, and reminds me a little of staying at the Tokyo Railway Station Hotel, as I did a few years back (particularly in the way you see all the little people scurrying like ants so far below!). But I also have a sense that this place was designed for the future, as the French powers-that-be envisioned the future 25 years ago. They got some things right, and some things wrong (they certainly didn’t envision needing outlets for charging multiple mobile devices)—and altogether the effect is somehow a bit quaint and endearing, as if Jules Verne had designed a hotel as a stationary twentieth century flying ship! Corleone is a town in central Sicily. Historically, many mafia bosses have come from Corleone. The anti-Mafia archive and museum is housed in Corleone (unfortunately not open when we visited). In fiction, Corleone is the birthplace of Vito Corleone in the Godfather novel and movies. However, the scenes in the Godfather trilogy purportedly filmed in Corleone were actually filmed in other Sicilian locations. Composition in photography is in large part about bringing an ordered visual experience to the chaotic reality of our world. This means finding, and emphasizing, patterns: patterns that are big, like the apartment buildings of outer Palermo from above, and patterns that are small, like the scraped-away layers of poster advertising on a wall in downtown Palermo. Winding down the steep, narrow streets of the medieval Sicilian town of Cefalu towards the seaward ramparts, I could hear faintly some rather delicious accordion music. Getting closer, he sat high up on the seawall, playing with some virtuosity. I made my way up. Not quite the same circumstances, but the same idea. I put a one Euro coin on the pavement next to him, and he smiled acknowledgment, and kept on playing. I wanted to give him the money before asking to take his photo, so he could say “no” to the photo if he wanted without worrying about monetary consequences. When I asked if I could take his photo, he said “sure,” and stopped playing for a moment. I showed him the image on the LCD. He said Grazie mille, and went back to his accordion and his sad, sweet tunes. I don’t get to use the word syncretic nearly as much as I’d like. Last appearing in this blog to describe the quasi-official mix of Shintoism and Buddhism in Japan, I am happy to trot out syncretic again in Palermo, Sicily. My definition of “syncretic” is that the word describes the situation when multiple belief systems that are manifestly, and on their face, contradictory live together in perfect harmony. Hence, Shintoism and Buddhism. In Sicily, particularly Palermo, syncretic well describes the historical and architectural heritage that is a blend of Islam, Byzantium, and the Norman strain of Catholicism. I had a great time today on a self-guided photo walking tour of the syncretic neighborhoods of central Palermo; tired and footsore at the end I stopped at a student hangout joint for an inexpensive grilled steak with potatoes. Yesterday to get away from the madness at the hotel, I got up early, had a quick breakfast, made my way out the barricades, and drove to Trapani, an old port city on the western tip of Sicily. In Trapani I parked, and walked through the oldest part of the city to the tower guarding the harbor, photographing along the way. I had lunch, a delicious stuffed calamari and insalata mixta. On my return walk to the car, I stopped to photograph the entrance to this historic Palazzo. Like most formal architecture around here, it is organized around an arcaded central courtyard. The Palazzo is now taken up with several pensiones (small B&B hotels), and probably some residential apartments as well. Leaving Malta long before sunrise—the taxi picked us up at the hotel at 3:45AM—under an overcast and misty sky I found myself looking forward to exploring Palermo, Sicily, a bit tense about the rental car drive from the Palermo airport to the hotel, and looking forward to my stay at a luxury hotel on the water near Palermo. It would nice to have a bit of quiet time for recuperation after some days leading a successful photography group in the Malta Archipelago. The hotel—Grand Hotel Villa Igiea—self-describes in its sales materials as “memorable,” as in “Experience a Memorable Moment.” Generally, the reviews I had read agreed that it was a pretty special place. Indeed, my arrival was to be memorable, but probably not in the way that the pamphlets contemplated. Coming down through the dawn on Air Malta I was struck by how beautiful and intricate the coast of Sicily looked in the morning mist. Clearly, the road hugged the coastline, and I really didn’t anticipate too much trouble finding the hotel. Utilizing the gentle guidance of the Google Maps directorate, I took the freeway towards Palermo, and actually got off the freeway and onto local roads at the right place. From there on, it was increasingly crowded and urban driving. I started to notice a substantial presence of gendarmerie at every intersection. What could this be about? I really had no idea that the problem was the hotel itself, and figured that if I could only work my way around whatever the issue was, I’d be fine once I got to the hotel. Before I knew it was driving through an impenetrable warren of tiny streets in a rough neighborhood in Palermo. This wasn’t getting me anywhere, second check! I backed up, turned around, and managed to trace my way back to the original blockade. I stopped, and had a pretty good look at the map. It seemed like if I went back almost to where I had left the highway I could go round a mountain that hugged the sea, and reach the hotel by a completely different route, approaching from the seaward rather than the city side. So it took a while, but I tried it. I figured at least I was getting to know the area. This time I got to within a couple of blocks of the hotel, and could actually see it, before I was stopped. I explained the situation to the police officer who stopped me and demanded my passport and proof of hotel reservation. A spirited discussion in Italian commenced within a group of uniformed police, and also some other tough looking men who were probably security agents of one sort or another. What turned out was that the Italian government had convened a Libyan peace conference at the hotel. For obvious reasons, security was tight, and no cars were allowed within a substantial safety “red zone” buffer around the hotel. Eventually, and it was a pretty long eventually, I was able to call the hotel, and they promised to send someone out to help me find a place to park the car and bring my luggage in. This took a while as I waited between two police barricades. I won’t go into the security process of getting into the hotel, although it was extensive. The Libyan conference is going on today and tomorrow. I can’t wait for it to be done. Meanwhile, the hotel is plenty memorable (my room is nice, too, as you can see in the image of my room curtains, above) with diplomats and mirrored-sunglass thugs and folks with badges milling around. Lots of self-important people in suits and heels, each one with a briefcase, many of them smoking, almost all of them constantly yammering on their cell phones! I have the feeling that if I put my camera on the tripod on my balcony—which overlooks not only the Bay of Palermo but also a podium where it looks like potentates are going to pontificate—that most likely I would get in a heap of trouble. Essentially, I am a prisoner in my very nice room. Going outside, I am stopped frequently for my papers. It isn’t really tenable. The restaurants and public rooms are closed to hotel guests except for the Libyan conference grandees. Running the gauntlet to get out and back in again is something to contemplate only after I good night’s sleep, since I’ve been up since 3AM. When I complained to the manager, essentially he said, “We hate it too!” I pointed out that he could have let me know so I could have changed my hotel arrangements. It was all over the news he said. Well maybe, but Palermo is not the top of the news in California in this still surprisingly parochial world we live in (probably they don’t follow the California fires much in Palermo, for that matter). Anyhow, he agreed to comp me to a room service lunch/dinner (as there was no other way to get to eat), and having a full belly helps a bit. Here’s to being memorable, and in the moment, but only in the right way! I am very pleased that Weston Gallery has sold two prints of my work. The subject of each print is a California mountain landscape. One is a panorama, Panorama of the Sierra Crest, photographed from the Alabama Hills above Lone Pine at sunrise, and shown below. The other image is a monochromatic version of a rough, eroded landscape, taken near the Middle Fork of the Kings River in Kings Canyon National Park. Meanwhile, from the far side of the world, my group had a great time photographing the island of Gozo (famous as the supposed Ogygia of Calypso and Odysseus fame), and made it to the ferry back to the “mainland” of Malta just ahead of a blustering storm!